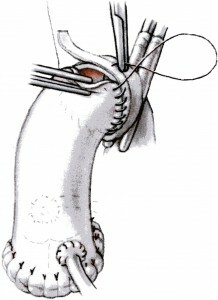 This operation involves replacing damaged aortic root. The aorta is a large vessel (artery) which supplies blood from the heart to the rest of the body. The aortic root is the initial portion of this vessel that stems from the heart and is attached to the aortic valve. If the both the aortic root and the aortic valve are diseased then both are replaced simultaneously with a plastic tube that already has a biological (pork or cow valve) attached on to it. There are cases that the native aortic valve is functioning well and the problem is related to the aortic wall tissue and the aneurysmal dilatation of the aortic root. 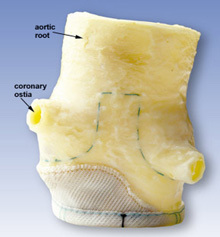 In these cases the aortic wall of the aortic root is replaced with a flexible plastic tube and your own aortic valve is preserved and repaired using advanced “remodelling” and “reimplantation” techniques. 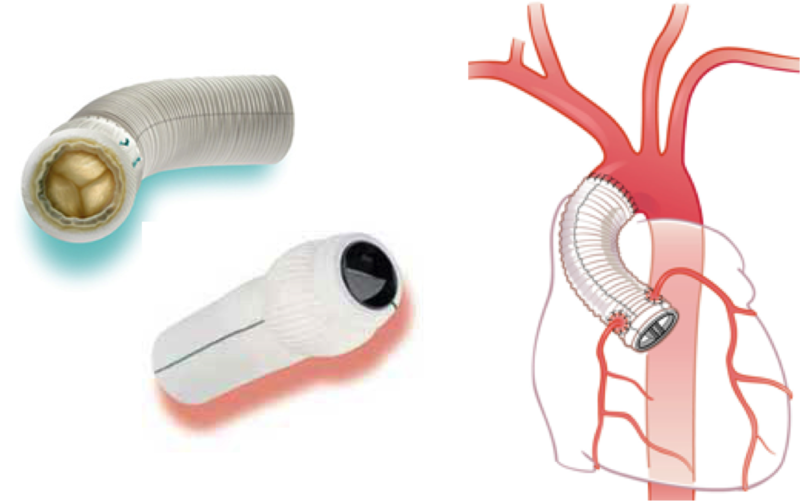 When your own valve can not be preserved, the replacement flexible tube will have a mechanical valve (made from synthetic materials) or a tissue valve (usually bovine or porcine in origin) incorporated into it. Alternatively, the diseased part of the aorta can be replaced using aortic root from human (homograft) or animal origin (bioprosthetic root). There are occasions where the patient’s diseased aortic valve (root) is replaced with his or her own pulmonary valve, which is the ” twin sister” valve to the aortic valve. The pulmonary valve (with a portion of the pulmonary artery) is then replaced with cadaveric pulmonary valve. This operation is know as “The Ross procedure”. Ross procedure offers several advantages over traditional aortic valve replacement with manufactured prostheses, one of the most important been the fact that it can grow along with the patient. This is why Ross procedure is recomended as the operation of choice in children, young adults or particularly active joung patients. The longevity of the pulmonary valve (autograft) in the aortic position is superior to bioprostheses, which tend to degenerate afteronly a few years in patients under 35 years of age. Furthermore, anticoagulation is not required as with mechanical valves. Thus, individuals can lead an active life without the risks associated with anticoagulation therapy. This is especially important for women of child bearing age needing aortic valve replacement, as anticoagulation is contraindicated in pregnancy. Once the anaesthetic has taken effect and you are deeply asleep, your surgeon will make an incision (traditionally about 25cm long, mini sternotomy access about 10-12cm long), down the middle of your breastbone and open the ribcage to reach the heart. The heart is stopped (using medication) and blood is re-routed to a heart-lung machine. This takes over the pumping action of the heart and lungs, adding oxygen to the blood and maintaining the circulation. Your surgeon will open the heart chamber, remove the faulty aortic root and sew in the replacement. While this is happening your coronary arteries will be detached and reattached to the new aortic root. Blood is then redirected back to your heart and the heart is restarted. The breastbone is re-joined using wires and your chest is closed using dissolvable sutures, stitches or staples. The operation usually takes about 4-5 hours. Replacement of the ascending aorta in bicuspid aortic valve disease: where do we draw the line? Sundt TM 3rd. J Thorac Cardiovasc Surg. 2010 Dec;140(6 Suppl):S41-4; discussion S45-51. Aortic valve-sparing operations for aortic root and ascending aortic aneurysms. Fazel SS, David TE. Curr Opin Cardiol. 2007 Nov;22(6):497-503. Review. Long-term results of aortic valve-sparing operations in patients with Marfan syndrome. David TE, Armstrong S, Maganti M, Colman J, Bradley TJ. J Thorac Cardiovasc Surg. 2009 Oct;138(4):859-64; discussion 863-4. Opening and closing characteristics of the aortic valve after different types of valve-preserving surgery. Leyh RG, Schmidtke C, Sievers HH, Yacoub MH. Circulation. 1999 Nov 23;100(21):2153-60.